The Supreme Court has reserved its decision in a landmark case considering the extent of the rights of the unborn. Chief Justice Mr Justice Frank Clarke said the court would give its judgment as soon as it was in a position to do so. The court is considering the extent of the rights of the unborn in an appeal taken in an immigration case. The case involves a Nigerian man, his Irish partner and their child, who was unborn when the legal proceedings began in 2015. The man wanted the State to revoke a deportation order against him. The State is appealing the High Court's ruling that the unborn has rights extending beyond the right to life in the Eighth Amendment to the Constitution. Earlier, the court heard the State's argument that the unborn has no other constitutional rights apart from the right to life, is extreme, striking and startling. Senior Counsel Maurice Collins urged the Supreme Court to uphold the High Court 's decision. He said the extreme nature of the State's arguments in this case, was arresting and the refusal to recognise the "unborn" as an "unborn child" was striking and startling. He said the State was submitting that outside the right to life protected in the Eighth Amendment, the unborn child was a "constitutional nullity" and that if that amendment was repealed, the unborn had no rights at all. Mr Collins said the State was making this argument regardless of the stage of development, whether it was just after conception or just before delivery. He said the State was submitting that the child in this case had no existing or prospective rights prior to her birth, capable of affecting the Minister for Justice's assessment of her father's application to have his deportation order revoked. The court was told that when the case first came before the court, the child was 20 days away from birth. Mr Collins told the court that the State's arguments, if accepted, would not be limited to the area of immigration. He said the State's position was, if there was no Eighth Amendment or if it was repealed, the unborn child had no constitutional rights whatsoever, unless there were some other rights in the Constitution that existed before the amendment was enacted in 1983. Mr Collins suggested the State's "absolutist" position was not compatible with the Supreme Court's previous decision in a case relating to frozen embryos. 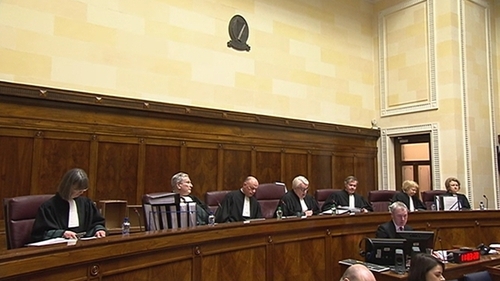 He said the court had found that the embryos were not entitled to the protection of the Eighth Amendment, but the court had ruled that the embryos were nevertheless entitled to a measure of constitutional recognition, entitlement and respect. Mr Collins said the State was suggesting that when the people voted for the Eighth Amendment they were unwittingly restricting the rights of the unborn and excluding them from the protection of any other constitutional provision. In his ruling in July 2016, Mr Justice Richard Humphreys in the High Court, found the unborn was clearly a child and had constitutional rights going beyond the right to life in the Eighth Amendment. He found that a reference to protecting and vindicating the rights of "all children" in Article 42a of the Constitution, includes the child before birth. The State has said the High Court findings could affect the functions of Government departments and state agencies dealing with expectant parents. It says there are now conflicting decisions from the High Court on this issue and clarity is a matter of general public importance. The Supreme Court agreed to hear this appeal urgently in the light of the planned referendum on repealing the Eighth Amendment. In his submissions, Mr Collins said the fundamental right to life of the unborn was a "gateway" right, essential to protect and vindicate the other rights of the unborn. He said his side's submission was that the right to life was already protected by the Constitution before the enactment of the Eighth Amendment. That meant, he said, the unborn had a "legal personality" capable of asserting constitutional rights, which could not have been taken away by the Eighth Amendment. Mr Collins said the right to life was encompassed in other articles of the constitution apart from Article 40.3.3. He said those who voted for the Eighth Amendment did not intend to prevent the unborn from claiming other constitutional rights that it was already entitled to. He said the principle right he was relying on was the right of the unborn child to the care and company of its father. Mr Collins said the unborn child benefitted from the care and comfort of its father through the benefits to its mother. He said the State was claiming that if you take away the Eighth Amendment, the foetus was a constitutional "non-person" from conception all the way to birth. Mr Collins also submitted that an "unborn" is an "unborn child" and was included in the definition of "all children" under another amendment to the Constitution, which was brought in after the Children's Referendum. Lawyers for the State were pressed by the court about whether or not there was a right to life for the unborn in the constitution before the Eighth Amendment. Senior Counsel Nuala Butler said the State's case was that this had never been definitively decided by the courts before 1983. She conceded that if this was an issue the court had to decide on, it would have to do so, without submissions on the issue on behalf of the State. Mr Justice Liam McKechnie said it seemed almost remarkable that the Minister for Justice steadfastly refused to give his position on this matter.